Look at when this was begun, and it becomes clear why color, bright incontrovertible color, was needed to keep my sanity & soul from going black as the deep political hole my country fell through. It's also an homage to Rothko. 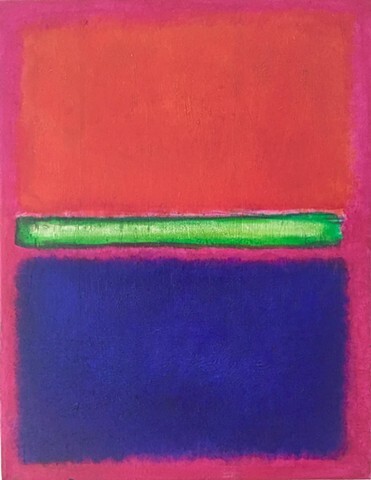 I was lucky enough to see Rothko works when in Washington DC in January, 2017, a perk upon participating in the Women's March. His paintings knocked me off my feet for their powerful, soulful, explosive serenity. As to the shameless copying ... I figure as long as one is above board, and the artist has sold for more than $1M, it should be okay to borrow in homage.